Want to hurt? Run a 5K in Leadville! But got my 2nd top 10 finish in a weekend. Getting used to this. Brownie threw down and said he would be in Leadville this weekend to race me. I figured he was going to try and show up at the half and I would have my way with him. No luck. Turns out he knew of a secret showdown race here. 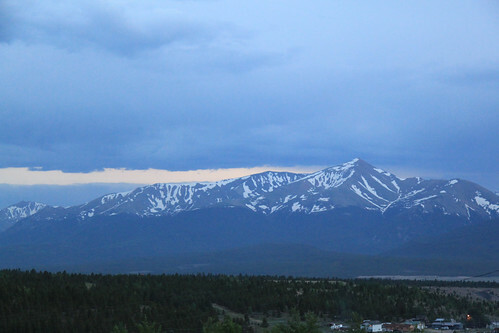 The Leadville Firecracker 5K. This race is put on by the Two Mile High Wrestling Club. There wasn’t a web page. There wasn’t much info. It was just show up around 8 to sign up. Race at 9. Brownie texted me at about 7:30 saying he was at the Burro getting a Bloody Mary. The showdown was on! I took the opportunity to run into town for my warm-up. Knew this was key here more than ever. Get those lungs working. My legs felt pretty good today. Found Brownie, chatted, then did some more warm-ups laps. Around 9 AM, a dude waved us all over to 5th Street, told us the course was well marked, and sent us on our way — by lighting some firecrackers and throwing them in the street. We were off! Brownie took off from the start. It was downhill and I was rolling but I have no sub-6 speed like he does. We quickly shook out and I was in 6th with Brownie up in about 4th. The course wound through the west side of town, back out towards my house, then out near Safeway. Then we turned back to town and ran Harrison back to the courthouse. I could see Brownie making gains on #3. I wasn’t having much luck holding any speed. Usual 2nd mile 5K burnout. Oh well. He had this in the bag over me. One dude passed me at mile 2 or so. From there, I held on to finish 7th overall. I was 2nd in my age group…behind Brownie! He got a sweet bobble-head doll trophy. That would have looked nice with my newly acquired mining pan trophy. Maybe next year. At the finish line, we sat and talked with other finishers, including Ryan Cooper. He is set to leave shortly for Silverton for Hardrock. I must say all this HR100 talk is starting to get me wondering. While chatting, this unmarked cop car drives up and parks right on the finish line of the race. As if we were doing something wrong. Apparently the cops did not notice the race going on. They were all about ticketing this parked car that was sitting there on the upcoming parade route for the 4th. The race director very calmly tried to say a word or so that there was a race going on but the police ignored him. As the cops were walking back to there car, another volunteer said something to the effect of your car is blocking our race finish line and the cop yells at her — LADY, LET ME DO MY JOB HERE. WTF? It was odd. Guess who doesn’t like working on the holiday? Douche. After that we hit the Manhattan for a few PBRs as per tradition. I sent Brownie on his way. Defeated again. 4 wins for him, 2 for me. 2 of those losses in Leadville. He is unstoppable up here I guess. Can’t wait for another rematch some day. Won’t be at the LT100 this year but maybe we can duel again soon — after I work on my short game. BTW, Garmin had the course short. JT’s time might not be official in that case. Jury? I spent the rest of the day doing various family stuff all over the area. 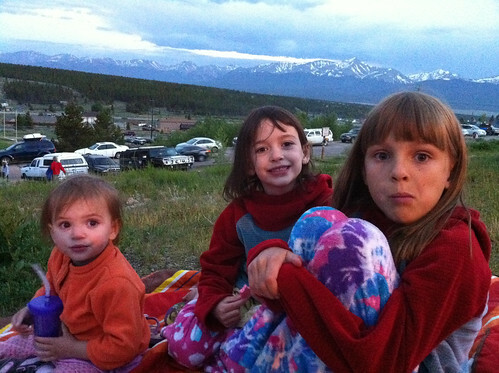 Finally ended up on the hill over looking Leadville for our first 4th of July up on high. 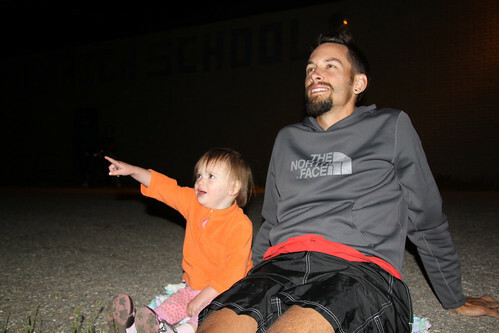 These have to be the highest fireworks in the land! Not a bad show for a small town. Kim looked at me during the show and said, “Can you believe we are actually here for this?”. Never get sick of Elbert I guess. That north ridge looks clean! Hmmm. A bit blurry but see the fire there. 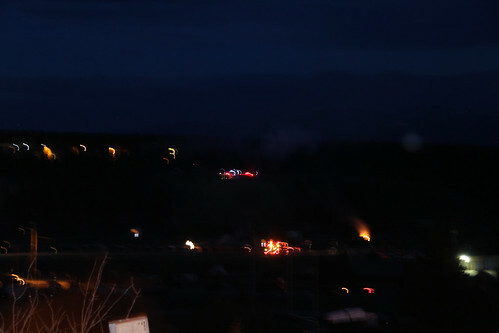 The firetrucks were on standby during the show and a blaze caught fire near the bottom of Dutch Henry Hill. They jetted over and put it out. I went 2.95 miles with an elevation gain of 195 feet in 00:20:08, which is an average pace of 06:49. Heart rate average was 159. View my GPS data on Garmin Connect.